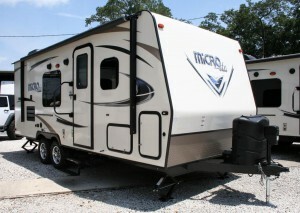 While traveling in a travel trailer is one– if the not the most–convenient experience, you’ll need to be careful when confirming your purchase if you’re traveling to different states across the country. Campgrounds in different states have different laws, and if you choose a travel trailer that’s under 27 feet, you will lessen the likelihood of having problems while on your camping trips. 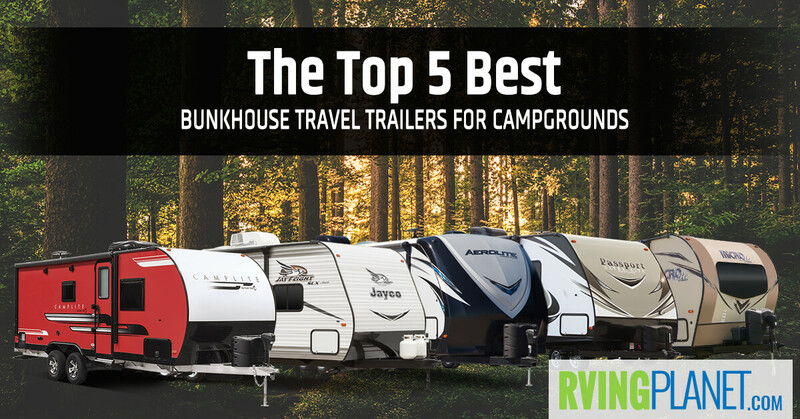 If there aren’t a lot of people traveling with you, we have already made a list of the Best Travel Trailers for Campgrounds, but if you want to bring the kids along, here are the 5 best bunkhouse travel trailers for campgrounds! 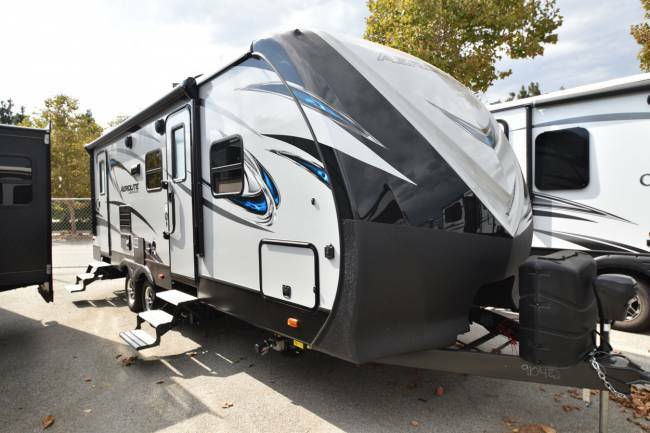 What puts an RV on the list: There are a myriad of options to choose from even when you go for bunkhouse travel trailers under 27 feet. 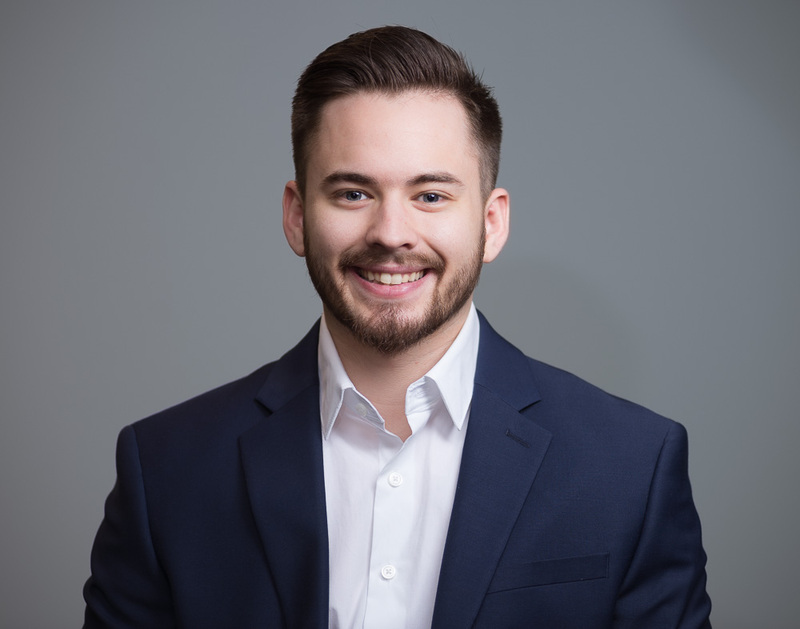 But, we have selected the ones that are newer models for better features, and the ones which have a good standing among users and critics alike! View All Forest River Flagstaff Micro-Lite Travel Trailer! Why we recommend the Forest River Flagstaff Micro Lite travel trailer: Although easily towable travel trailers weren’t part of the criteria, you can opt for the Flagstaff Micro Lite if you’d like something lightweight. The heaviest floorplan tips the scales at 5,277 and still manages to house as many as 7 people in the bunkhouse floorplans! No matter which floorplan you choose among the lot, each have a 20 to 25-feet footprint! While we particularly were fond of the Flagstaff Micro Lite 19FDBH and the Flagstaff Micro Lite 25BHS, it goes without saying that others are noteworthy in their own way. 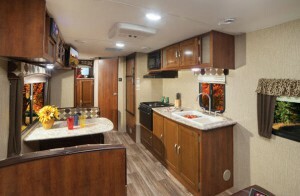 You won’t be missing out on the what makes the luxurious aspects of a travel trailer, if any at all as it has 13,500 BTU ducted AC (which you can upgrade to 15,000 BTU), 44-inch family dinette, premium soundbar, full aluminum frame and many other impressive traits! Why we recommend the Dutchmen Aerolite travel trailer: Don’t let the sleek look of the Aerolite by Dutchmen make you think that looks are all there is to it. 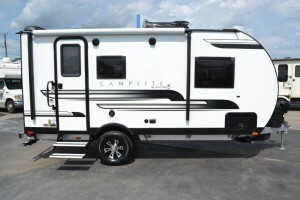 Apart from the fact that it has 16 different floorplans with a 3-9 sleeping capacity, it’s also quite lightweight. 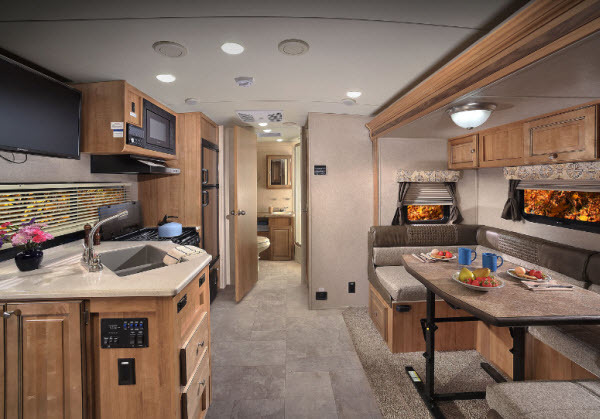 The Aerolite 2320BHSL floorplan has a bunkhouse and spans 27 feet, ensuring that you’ll have the maximum length and sleeping capacity. If you’re not on the lookout for bunkhouse travel trailers in particular, it has 16 floorplans which provide you with a variety of other options too. All of these have the same feature set (for the most part). 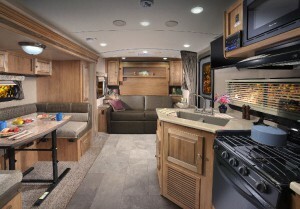 Some of the features that impressed us were the huge interior height of 82 inches and the power awning with LED lights. 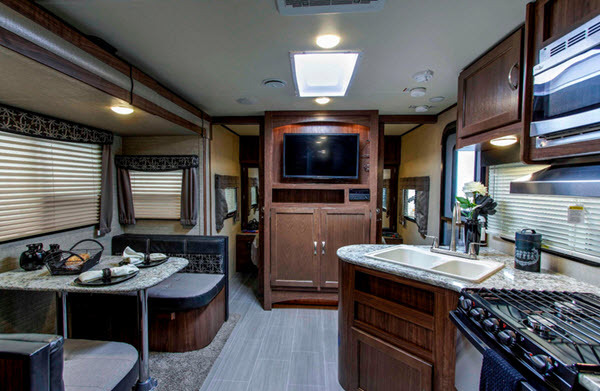 If you prefer upgrading your RVs to give you the most luxurious camping experiences, you’ll be happy to know that the Aerolite has quite a few upgrade options such as the 15,000 BTU AC and the solar prep in the premium package! Livin Up To The Name! Why we recommend the Livin Lite Camplite travel trailer: If you prefer something lighter than our other 2 choices, then look no further than the Livin Lite Camplite travel trailer. 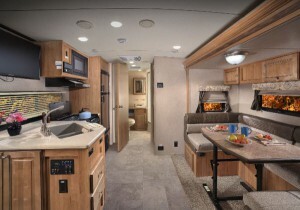 It lives up to the name, as all of its floorplans range from 2118 to 3684 pounds (GVWR). Furthermore, the footprint ranges from 14 to 24 feet so whether you choose the Camplite CL16BHB or the Camplite CL21BHS, you shouldn’t have any problems parking it on a campground. As far as features go, we were really impressed after finding out that the Camplite has a 6-sided aluminum superstructure and high-polished aluminum rims. However, you’ll probably be more interested in the 6 cubic feet refrigerator and the efficient LED lighting. 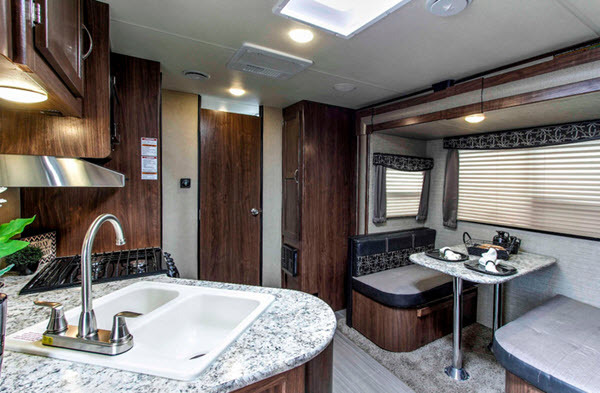 Upgrading is also a strong suit of the Campsite, as you can add a respectable amount of upgrades ranging from 24″ LED TV to power awning with LED lighting. 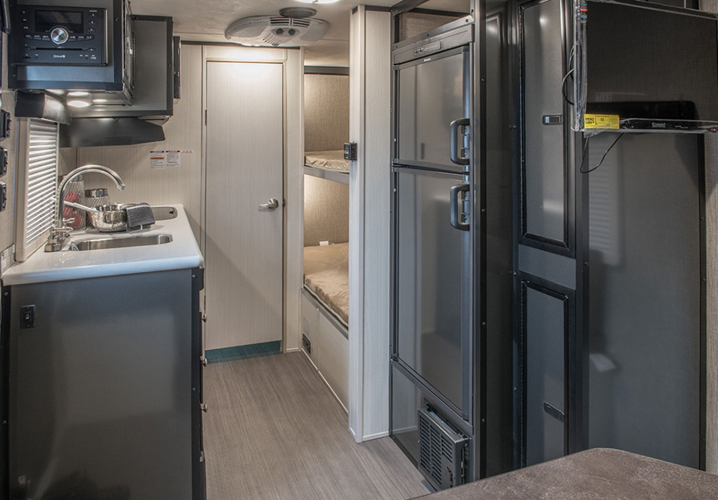 All in all, Livin Lite has given us more than a few reasons to consider this as one of the best bunkhouse travel trailers for campgrounds! 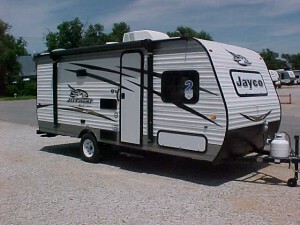 View All Jayco Jayco Jay Flight SLX Travel Trailer Floorplans! 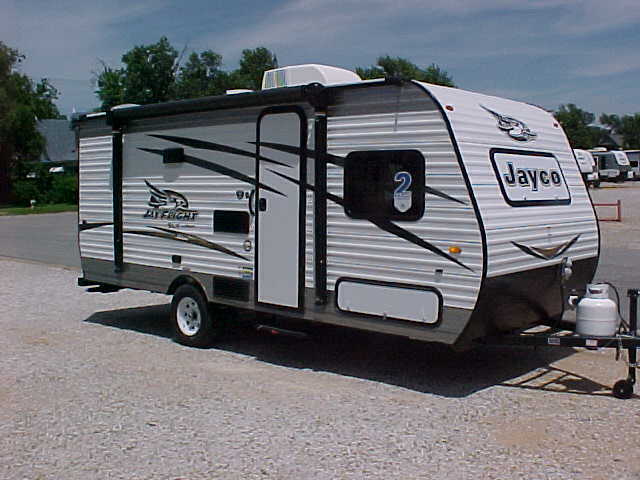 Why we recommend the Jayco Jay Flight SLX travel trailer: You’d be hard pressed to find a list of the best travel trailers–on RVingplanet or otherwise–that don’t have at least one travel trailer by Jayco on it. 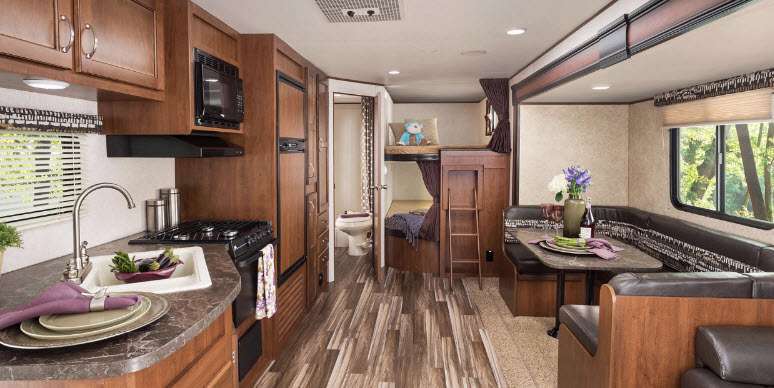 This RV isn’t an exception either, as the Jay Flight SLX features 17 floorplans. These cover a range of different layouts, sizes, and sleeping capacities as you see on the table above. Of these, 3 floorplans are bunkhouse travel trailers under 27 feet: The Jay Flight SLX 154BH, the Jay Flight SLX 174BH and the Jay Flight SLX 224BH. As far as the features go, this travel trailer has everything you’ll ever want in a camper and then some. 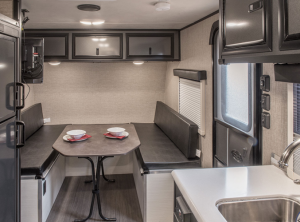 From the laminated countertops to the vinyl floor, Jayco has paid some serious attention to the look and quality of the Jay Flight SLX. Upgrading is available in both packages and standalone options. These include–but are not limited to–compliance with Candian standards, Queen bedspread, 15,000 BTU air conditioner and closed underbelly. 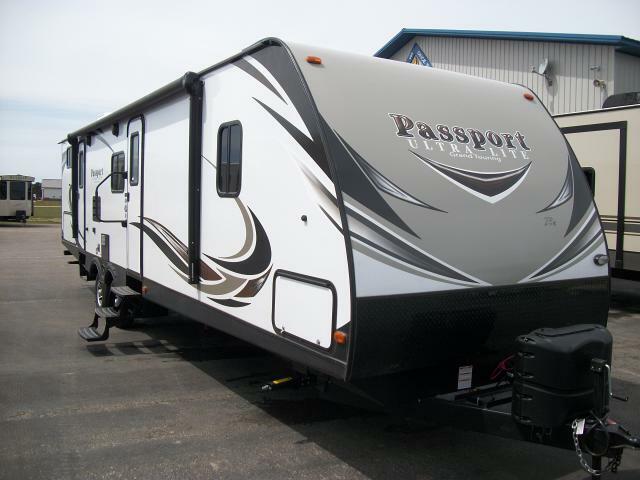 View All Keystone Passport Travel Trailer Floorplans! 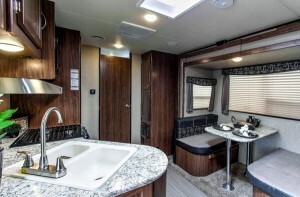 Why we recommend Keystone Passport Travel Trailer: If you don’t have anything specific in mind and just want to take a look at a ton of options to see which would be the best for you and your family, then the Keystone’s Passport travel trailer with its 31 floorplans is the place to start. 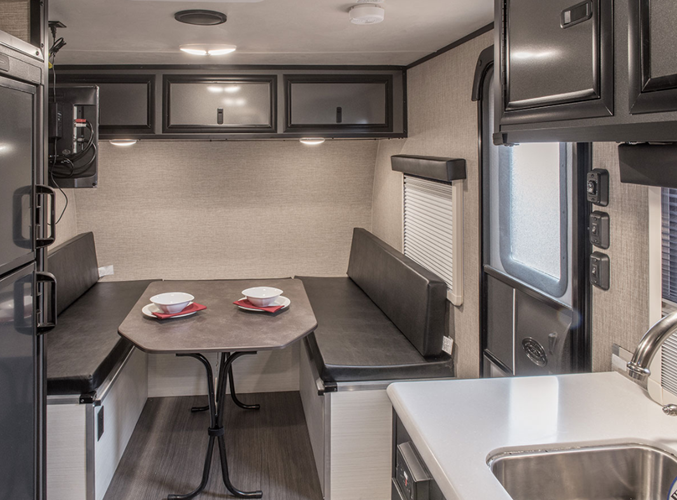 We liked the Passport 175BH Express and the Passport 239ML Express as they are under 27 feet and have bunkhouses, but the others have appreciable layouts as well! The Keystone Passport has a lot to show off, from the 2″ laminated aluminum floor to the 13,500 BTU AC coupled with a 35,000 BTU furnace. Safety in this particular RV includes a smoke alarm, fire extinguisher, propane gas leak detector, carbon monoxide detector among many others that you can check out on the RV page. You can choose between the Express and the Grand Touring variants, the latter providing slightly upgraded features that can be further upgraded as you use it! 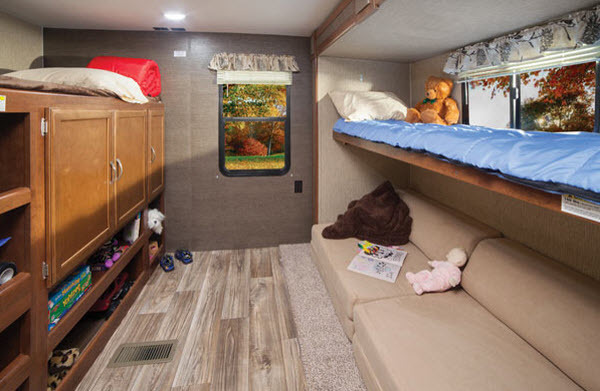 All in all, you shouldn’t be surprised when you stumble upon one of these when looking for a good bunkhouse travel trailer for campgrounds. 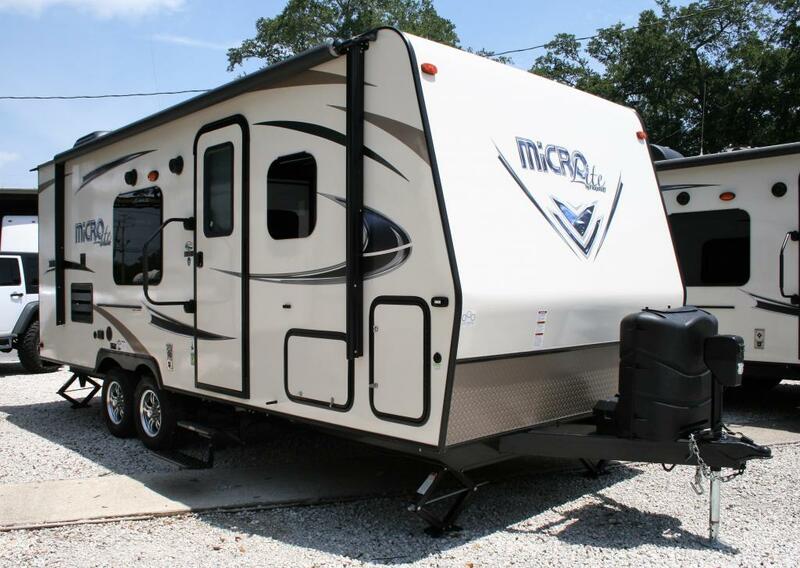 Be sure to contact us for the best prices on these and many other travel trailers! Share with us your bunkhouse travel trailer for campground in the comments below!